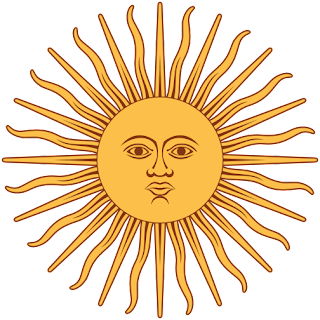 And reaching back into the archives of 'Lost Weekends In Vexillology' I noticed that both Uruguay and Argentina are on my list, and they have one thing in common: the Sun of May. Adopted on February 27th, 1812, the flag of Argentina was designed by Manuel Belgrano and there are two main interpretations of the colors- with popular belief linking the colors to the sky, clouds and the sun- but other more historical contexts indicate a possible loyalty to the House of Bourbon. At the time, the initial revolt against Spain was sparked by the French invasion and occupation of Spain during the Peninsular War. With the Bourbon Monarchy overthrown and imprisoned, the colors of the flag neatly walked a tightrope of autonomy and independence while still demonstrating loyalty to the monarchy of the mother country. 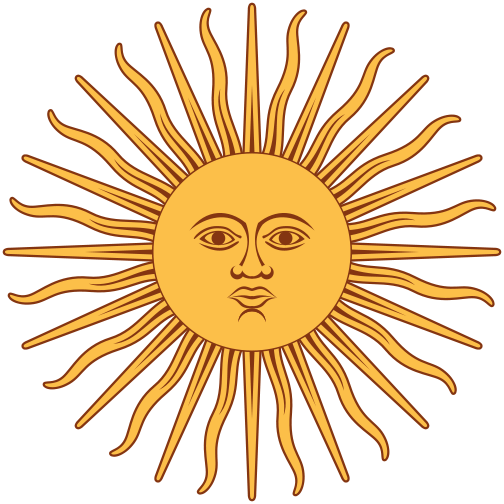 The Argentine version of the Sun of May has thirty-two rays, alternately wavy and straight. As a flag, Argentina has had a measurable design impact on the region. Uruguay's flag has the Sun of May as well- Paraguay, is a horizontal tricolor though with slightly different countries. El Salvador, Honduras, Nicaragua all follow the configuration of horizontal color with similar shades of blue and white. 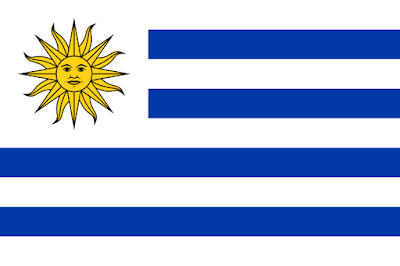 Adopted on July 11th, 1830, the flag of Uruguay has nine stripes which represent the original departments of Uruguay and the Sun of May- which only has 16 rays as a posed to Argentina's 32. The Sun of May represents a new nation in the world. Uruguay. while originally part of the Viceroyalty of the Rio De La Plata, had a long and bumpy road to Independence. First, they broke from what would become Argentina- over the question that would consume South America post-independence. Centralism versus Federalism... Jose Artigas, the founding father of Uruguay championed political and economic autonomy for the provinces, especially the Banda Oriental (Literally, the 'East Bank' which is where Uruguay was and remains to this day.) The government in Buenos Aires wasn't interested in federalism though and doubled down on centralism, refusing to even seat the delegates from the Banda Oriental. That was enough for Artigas, who raised some troops, took Montevideo and said 'Nuts' to Buenos Aires and formed an autonomous government. In 1816, the Brazilians got in on the fun, invading and occupying the country and annexing the Banda Oriental and calling it the Cisplatina Province. In a weird turnabout of history, the Thirty-Three Orientals declared independence and with the help of the friends from across the river they launched the 500-day Cisplatine War which finally secured Independence for Uruguay. So that's the 4-1-1 on the Sun of May and the flag that bear it's smiling face- Argentina and Uruguay. Remember, until next time: keep your flags flying, FREAK or otherwise!